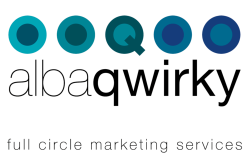 Albaqwirky is a Scottish marketing services company that likes to approach things differently. Tick, tock, tick, tock there never seem to be enough hours in the day and occasionally you could just do with an extra pair of hands to help out. Perhaps you don't have a marketing department or just don't have the people-power to cater to your growing business needs. Whether it's reinforcements or a one off project, outsourcing your marketing can provide a flexible, affordable and effective solution.